with a $20 Gift Voucher! For my project i have used Mad Mummy. 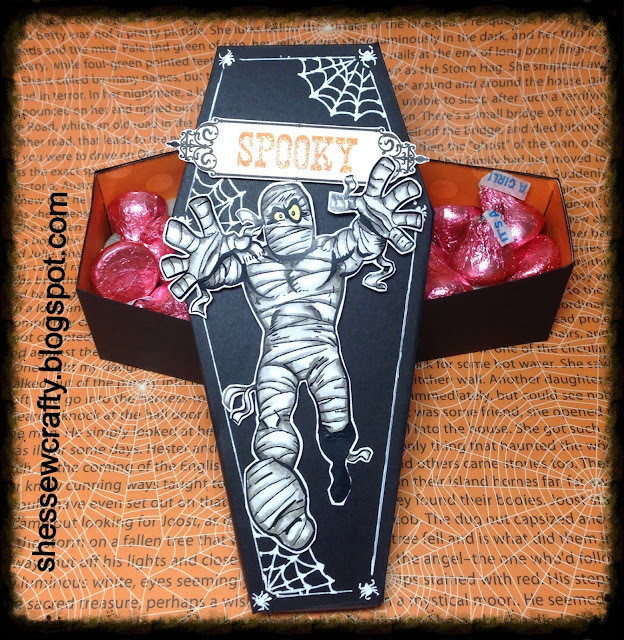 I seem to be fascinated right now with coffins, so I have made a coffin treat box. I lined it with some fun orange design paper and decorated it with white gel pen by doodling some spiders and webs. My kids came home from school and saw this box and exclaimed, "Cool!...Awesome , it's a coffin!" Perfect Halloween treat box, I think! The lighting washed him out a lot as in RL he has more depth to him. I really enjoyed this project and now I need to make several more so each child gets a "Cool" treat box! Can't wait to see some of you join in with this Fall Color challenge! This truly IS cool and awesome!!! Fabulous project! Thanks for joining us at The Corrosive Challenge! Totally freakin' kewl. Love that mummy and how you colored him. What a great treat box. The kids were right this is awesome!! I love it...I want one! LOL!! Thanks for playing in our neighborhood at 613 Avenue Create! This is sooooo fabulous! You have inspired me to go and make one of my own now! Thank you for joining The Corrosive Challenge!